Publicity Stills of "Helen the Baby Fox"
Early spring in Hokkaido, northern Japan. Taichi, a young boy who tends to be a dreamer, has just arrived from the big city to live with his mother’s new boyfriend, a veterinarian, and his daughter. One day after school, Taichi discovers the cub of a northern fox crouching near the side of the road and despite the objections of those around him, decides to take care of the lovable creature. The baby fox cannot see, cannot hear and cannot bark. Even when offered milk, it just ignore. So Taichi names it Helen, after Helen Keller, the first blind, deaf and mute woman who was able to communicate using the sign language. Helen responds to Taichi’s devoted caring efforts and begins to strive for live, in spite of her frail body. The boy and his veterinarian family watch over her with encouragement and love. Remember those enormous picture storybooks your primary school teacher used to read to the whole class? They sure bring back fond memories, don’t they? Besides the attractive colourful illustrations, those wholesome stories also conveyed some important life lessons in ways that enabled young minds to learn and have fun at the same time. This latest Japanese import to reach our shores works exactly like those educational stories, except that everything is envisaged on the big screen. From the vivid colours to the plot, this movie directed by Keita Kono will remind you of those childhood days. The story is straightforwardly simple. 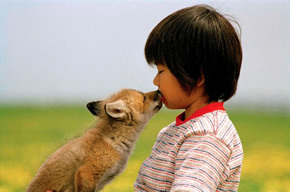 A young boy (played by the endearing Arashi Fukasawa) finds a sick baby fox at the roadside and decides to take care of the adorable animal. To make things uncomplicated, enter a vet who happens to be the new boyfriend of the boy’s mother. Together with the vet’s daughter, a story about hope, survival and love is told. The plot is clearly geared at family crowds, or boys who want to bring girls on a movie date. The 109-minute movie unfolds itself in a predictable manner. 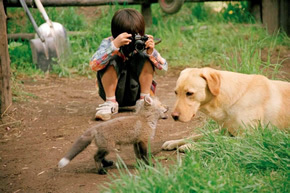 The discovery of the baby fox, the introduction of the boy’s new family, the comical and cute moments between the boy and his newfound pet, the tragic and moving moments when the unwell animal almost loses its life – all these scenes will play out exactly the way you expect them to. Not that this is a bad thing though, considering the genre of this heartwarming drama. There are a few ideas that are effectively dealt with in this movie. Responsibility, perseverance, care and concern for others, and most importantly and somberly, death, are just some of the lessons younger viewers will walk away with. For older audiences, there are always the beautiful images to look at. The vast fields filled with lovely dandelions, the wide and open seas, and other gorgeous sceneries of Hokkaido will please those who like their movies to be picturesque. Animal-lovers are also in for a treat because this movie features a few interesting animal characters. There is a greedy dog, a talkative parrot, billy-goats, rabbits and geese, just to name a few. Of course, the star of the movie is the titular baby fox, which gives a very commendable performance here, from acting sick to giving the impression of feeling touched. The emotions of this animal are all brought out by its trainer very well. And for some of you, this may be the first time you hear a fox bark. The credit of this movie also goes to the human cast. Fukasawa delivers a fine performance, thanks to his boyish and charming features. The vet played by Takao Osawa (who was also very likeable in 2004’s Crying Out Love, in the Center of the World) puts his nice-family-man image to fine use in this role. In short, when you have the always-workable ingredients of cute animals, an adorable child actor and a moving plot, the movie would not steer too off course. Above all, this movie will motivate you about life. The baby fox is named after Helen Keller, the deaf and blind American author who had inspired the lives of many, right up to today. And the lovable creature is personified in such a way that you’ll feel for its mishaps and its constant will to persevere in its fragile little life. Yes, Helen the baby fox is exactly like one of those animal characters in a storybook you read in your younger days.